Packages: Our special packages are unique entertainment packages that can be ordered anytime throughout the year by anyone. They are designed for the special occasions in your life or the special programs that you are running or the special events that you may have happening within your organization. Seasonal: Hawaiian and Polynesian culture is not a culture limited strictly to summertime luaus, but a culture that is to be enjoyed throughout the year. Here, we show you how you can easily integrate a Hawaiian theme into each season of the year and provide theme ideas for the current or upcoming season. The Barefoot Hawaiian also runs special seasonal and entertainment programs and options that are normally available only in the season to which they are appropriate. It is on this page you can find out what special seasonal items we are offering for the current or upcoming season. If you have been following our new 2010-2011 school year and new season of classes, you know all about HúGáSM and maybe have even attended a session or are even a regular. If not, please visit our Dance Studio page for the full details. Tone your body to the rhythmic sounds of native drums gently beating in the forests of Polynesia. October 11-16: "Stand Up and Be Counted"
An all standing workout, no floor mats or pads needed. October 18-23: "Fire, Water, Wind"
The hot, the fluid, the cool – unwind and heal to the sounds and effects of nature. HúGáSM is perfect for moms, dads, guys, girls with a busy lifestyle. It’s great for those who find it hard to have time for regular exercise. "Hulaween" is the way we, at the Barefoot Hawaiian, celebrate Halloween and we are ready to celebrate it with you, Hawaiian Style. Up in the air about a Halloween party or theme? Consider having it Polynesian style. Everyone is to come dressed to your party or event in a Hawaiian, Polynesian, or other South Pacific island themed costume. Plus, with a performance purchase everyone attending your party receives a discount in our store. Our Halloween performances include hula lessons for everyone and our expert performers will serve as the perfect impartial judges for your costume contest. We can judge for the best male, best female, most authentic, most native-like, and so on. Moreover, for Halloween, we will provide a free gift or gifts (depending on size of the performance you order) to award to the winner or winners. For children's parties, our Hulaween entertainment can include the telling of an age-appropriate authentic Hawaiian ghost story. Our Hulaween performance is also excellent choice entertainment for October Festivals (Octoberfest) that you are running in your town or at your establishment. Call us now to ask about all the ways we can help you run a great Halloween party. Immediately after Halloween, we depart from scary costumes into pure fun as we head into the Thanksgiving and the Christmas seasons, with a children's favorite, our Keiki Karnival, right here on location at the Barefoot Hawaiian. Great fun for children of all ages. Entry is FREE. Tickets to play games, only 25 cents each. Get a personal portrait done by "Kapela," our resident artist, for only $10. As you get up early Thanksgiving morning to start cooking your Thanksgiving feast, be sure to tune into WGN-TV, Channel 9, from 8:00 - 11:00 AM to catch our performance in the McDonald's Thanksgiving Day Parade, a.k.a, the Chicago State Street Thanksgiving Day Parade. Enjoy watching our Professional Fire-Knife Performers, Professional Dancers, Keiki Division Dancers, Drummers, Banner Carriers, and more entertain you while you cook or enjoy your morning coffee. Better still, come on down and catch the parade in person. The Barefoot Hawaiian Office, Store, & School will be closed Thursday & Friday, November 22 & 23 in honor of Thanksgiving. Normal business and hours resume Saturday, November 24. And don't forget the 50% Off Sale on that Saturday. See our News Room page for details. November 8-13: "Sun, Sand, Sea"
As our special way of showing our gratitude, for the week of Thanksgiving, classes are free - Space is limited, advanced sign up required. Call or send an email. For the Thanksgiving week, we will only be having classes on Monday and Tuesday. November 29 - November 30: "Peace and Tranquility"
Please note that HúGáSM will run only on Monday and Tuesday of this week. No HúGáSM sessions will be run on Thursday and Saturday. Mele Kalikimaka means Merry Christmas in Hawaiian, and Santa is on his way. You are listening to "Christmas in Hawaii" by Danny Couch. Used with permission by Danny Couch. The Barefoot Hawaiian has much to offer you this holiday season and just about everything you need to provide you with a Christmas in Hawaii. In the way of entertainment and performances we feature special holiday season shows. These shows feature special Christmas costumes, music, hulas, and more. The Barefoot Hawaiian gears up its store for gift and holiday shopping. Get that unique gift for the hard-to-buy-for person in your life. We have Christmas Aloha Shirts, Christmas Stockings, Tree Ornaments, Holiday Music, and more. Running from November all the way to Christmas, is Barefoot Hawaiian's Holiday Alphabet 50% Off Something on Saturdays Sale. On Saturdays, from 1:00 to 3:00 PM, starting November 3 and ending on December 22, will be a 50% off sale on three groups of merchandise with it being a different group of three every week in an alphabet countdown. See the News Room page or the Mele Kalikimaka page for the complete schedule. For our special web page with full details on the way we celebrate Christmas, click the link below. We hope everyone had a wonderful Christmas and that you are now looking forward to celebrating the entrance of a new year. Full business resumes Wednesday, January 2 with all normal store and business operating hours. Dance classes resume from Christmas break on Monday, January 7. The Barefoot Hawaiian wishes everyone a happy and prosperous year in 2019. We hope you enjoyed the holiday season. We are looking forward to bringing Hawaii to you in 2019 just as the Barefoot Hawaiian, Inc. has been bringing to you since 1983, and Barefoot Hawaiian owners and founders, under the previous name, have been bringing to you since 1973. Thus, with 2019, we enter into our 46th year of bringing Hawaii to you and the entire North American mainland. Love is in the air at this time of year, and the Barefoot Hawaiian is ready to celebrate St. Valentine's Day and the season with you. For Valentine performances, our shows focus beautifully around love and the "Be My Valentine" theme. Our performances will feature special love songs and dances. You will hear the Hawaiian Wedding Song, Blue Hawaii, and many others. Okay, by now we are all starting to feel the Winter blues and eagerly awaiting the delightful Spring weather to arrive, especially after this rough Winter. Change that by getting into the Aloha spirit now. Whether you are a community organization, a company, or a family, now is actually one of the best times to have us out for a Hawaiian show. For one, we are more available during this generally-considered off-season here in the Northern Midwest versus the high demand we encounter during the late-Spring and Summer Luau season. Two, your family, friends, employees, or public is also generally more available at this time of year for a little festivity. Three, who would not love your bringing a little Aloha warmth into their lives at this colder time of year? Visit our Event Schedule web page for the details. Are you considering having a luau or Hawaiian-theme party this coming spring or summer? If so, then our expert advice to you is that you should already be well into planning it, especially if your luau will be held on a weekend during the months from May to September. If your weekend party will be or extend into the evening — Friday, Saturday, or Sunday evening — then your early planning is even more crucial. DATE — If you are planning on a weekend luau in spring or early summer, deciding the date and approximate time is the most important planning issue and you should have this already determined by March to ensure a successful event. 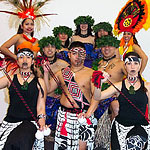 ENTERTAINMENT (DANCERS) — The next most important issue after deciding the date, is acquiring your Polynesian dance entertainment. Even with our huge troupe of professional dancers (the largest in the Midwest) we can still become fully booked with every performer assigned to a show on a weekend day during the spring and summer. To avoid hearing, "Sorry, we are fully booked that day." call us early. If you want more than two dancers, you should be contacting us by March to ensure getting what you want. FIRE DANCERS — These performers require special mention. There are only a handful of professional fire knife performers in the Chicago area. Most Hawaiian companies have none. 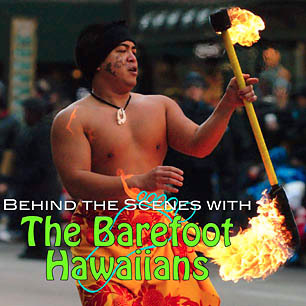 The Barefoot Hawaiian provides more than 90% of the fire performances in the Chicago area. Moreover, we are fully insured to perform fire; most other companies are not. A fire performance in the evening on a summer weekend is the most spectacular and most desired performance. If you want a fire performance for your luau, make these arrangements very early. MUSICIANS — These performers also require special mention. There are only a small number of Hawaiian musicians in the Chicago area. Some Hawaiian companies have none and offer only music on CD. The Barefoot Hawaiian has a soloist, one full band, and a couple of two-person ensembles. For live Tahitian drumming, we have several trained and qualified Tahitian drummers. If you want live music or drumming or both for your Spring or Summer luau, these arrangements also need to be made very early. Plan early and you can be sure of getting the dancers, fire dancers, live music, and the Polynesian cuisine that you want and need for a successful luau. Are you considering having a luau or Hawaiian-theme party this coming summer? If so, then our expert advice to you is that you should already be well into planning it, especially if your luau will be held on a weekend during the summer months from Mid-June to Mid-September. If your weekend party will be or extend into the evening — Friday, Saturday, or Sunday evening — then your early planning is even more crucial. DATE — If you are planning on a weekend luau in summer, deciding the date and approximate time is the most important planning issue and you should have this already determined by May to ensure a successful event. ENTERTAINMENT (DANCERS) — The next most important issue after deciding the date, is acquiring your Polynesian dance entertainment. Even with our huge troupe of professional dancers (the largest in the Midwest) we can still become fully booked with every performer assigned to a show on a weekend day during the summer. To avoid hearing, "Sorry, we are fully booked that day." call us early. If you want more than two dancers, you should be contacting us by May to ensure getting what you want. MUSICIANS — These performers also require special mention. There are only a small number of Hawaiian musicians in the Chicago area. Some Hawaiian companies have none and offer only music on CD. The Barefoot Hawaiian has two soloists, one full band, and a couple of two-person ensembles. For live Tahitian drumming, we have several trained and qualified Tahitian drummers. If you want live music or drumming or both for your Summer luau, these arrangements also need to be made very early. Somehow most people believe that a Hawaiian luau can only be held in the summer months here in the Midwest. Hawaiian Weather — Hawaii is not 95 degree temperatures with the high muggy humidity we see here in the Midwest. Its temperature are in the 70's with a nice ocean breeze. Holding your luau in late spring comes closer to the Hawaiian outdoors than the summer months do here in the Midwest. Plus, enjoy fewer bugs. More Available Bookings — If you read the previous section on luau planning you know that getting everything you need for a Summer luau required early planning, and may require more phone calls and more turndowns. Hold your luau in the Spring and you will find it much easier to get your entertainment, music, and more. For a Spring luau we can often send out a dancer same day. We often can provide musicians, several dancers, fire, drummers, etc. with just a few days notice. So have that last minute luau this coming weekend and call us. 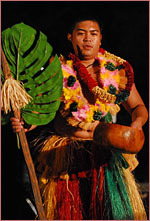 Spring Public Shows — The Barefoot Hawaiian performs many great public shows in the Spring. For 2015, we have over a dozen public shows that we are performing in Spring. Visit our Event Schedule to see the complete list. Spring really is luau season! Summer is here and it is Luau season. Need we say more? Whatever you have planned, consider adding music and entertainment from the Barefoot Hawaiian to your event. To learn more and get the full details on this very unique and special way to celebrate your child's next birthday, download the full flier below. Girl Scouts and Brownies, learn the traditions, ethnicity and practices of the Hawaiian and Polynesian cultures and earn a patch proving that you worked this program. Intended to be run at the troop level, Girl Scout and Brownie troops, with adult troop leader involvement, this package, is specifically designed for scouts or brownies to earn a patch denoting their participation in this program. This is a field-trip program for the troops run right here at the Barefoot Hawaiian studios. It's like a min-trip to Hawaii for your girls. To learn more and get the full details on this 2-1/2 hour program on this very unique way for scouts or brownies to earn a cultural patch, download the full flier below. Known as "HUI ALOHA" or a gathering of friends, this is a unique way for adults to escape and gather in friendship for a special kind of party. No need to prepare your home for a party as it is all held right here at the "Barefoot Hawaiian Island," as we call it, or a/k/a, our all new studio and party room. Learning the authentic Hawaiian art of "Haku"
To learn more and get the full details on Hui Aloha for your next adult event, download the full flier below.